Suffering from an infected piercing? 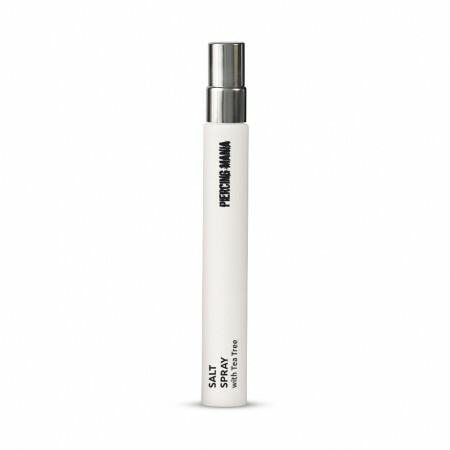 In addition to the normal salt spray, we now also have this spray with added tea tree oil. Tea tree oil is known for it's anti-inflammatory qualities. Suffering any skin irritations, minor infections or simply just got pierced? This spray is a truly must have thanks to the powerful combination of salt and tea tree. The bottle is refillable, allowing you to reuse the spray bottle as much as you want. Are you looking for a bigger bottle? With the Salt Spray with Tea Tree XL you will get four times the content for not even twice the price. The XL bottle is too large to fit through your mailbox. Therefore, the free standard shipping does not apply for the XL variant. The salt spray I had bought from my piercers had ran out so I quickly searched for some on Google (avoiding work) and this came up. I had never seen the site before and after having a look at the reviews I decided I wanted to try some of the products in the hope it would not only keep my piercing clean and help it heal but also as a bit of a last ditch attempt to help deal with a nose bump that I've been trying to get rid of for quite a while using various products and methods with little success. It was getting to a point where I thought maybe I would never get rid of it and wondering if the only solution was to remove the piercing all together. Recently had my daith pierced so needed a spray for cleaning.. read reviews from here.. very good spray its sea salt & tea tree. Will buy more in the future.